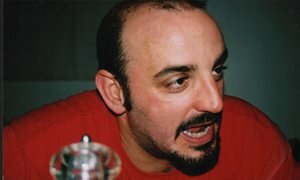 I met Carlo Neri in September 2002, at a London anti-war demonstration. We were inseparable. Within six weeks he’d moved in with me. It felt right, and three months later we got engaged. When we met, Carlo was a locksmith. He was a member of the Socialist Party and the GMB union. He was practical, he drove, he fixed things. He changed locks: my flat; friends’ flats. He was bored and wanted to do something meaningful – to be a paramedic and ride his beloved motorbikes. He quit being a locksmith, and started doing import/ export work, fine Italian foods. He travelled more. He began rebuilding his relationship with his son, who lived in Cornwall. Four days out of every fortnight he went away. We had pictures of his son and his sister on the bookcase. We had an abundance of food and wine from Italy. Carlo cooked beautifully, and we threw great parties. Everyone adored him – my friends, family, work colleagues. We all loved him and trusted him. We were planning a wedding together. I felt blessed. The next summer we were set to holiday in France, coinciding with the final leg of the Tour de France. Carlo loved cycling. The night before, Carlo came home and said “I’m sorry but I can’t go. I have to go to Italy, my father’s sick.” He left for Italy, where his father had suffered a stroke. He rang me every day that he was away. Then things started to change. His father’s illness meant he had to spend more time in Italy. He began to disclose difficulties in his past. There had been a family history of domestic abuse, and he felt guilty and ashamed of not protecting his mother. This trauma was re-emerging and deeply troubling him. He spent Christmas 2003 in Italy and was due to come back for New Year’s Eve, but extended his stay as his father’s condition worsened. On January 1st he rang to say his father had died. When Carlo came home the change was tangible. He had lost weight, even his eyes looked different. It was apparent that he was having a breakdown. Then he disclosed that his father had sexually abused his sister. He was devastated. He said “I need time, I just need time to sort myself out” and he began to disappear. Our relationship was breaking down, his behaviour became volatile and I felt completely helpless. In April 2004, Carlo went missing for a week culminating in him sending a text message saying “I’m in Italy, I’m going to kill myself”. He came home but things descended even further into an impossible mess. I knew I was losing him but he kept telling me how much he loved me and needed me. By this time I was falling apart too. We struggled on for another six months, with great difficulty, because he was a changed man. Then one day he sent me an email at work which said “I never want to see you again, I can’t cope with this” and I never saw him again.